Did conversation at your family get togethers over Christmas turn to your family history? Finding out about the lives of your ancestors can be an absorbing and rewarding hobby, and here at the Essex Record Office we can help you get started on your search, whether you visit us in person or use our records online. Talk to your relatives – particularly older generations. Find out what they know and remember, and write it all down. You could even make a sound or video recording of your conversations. 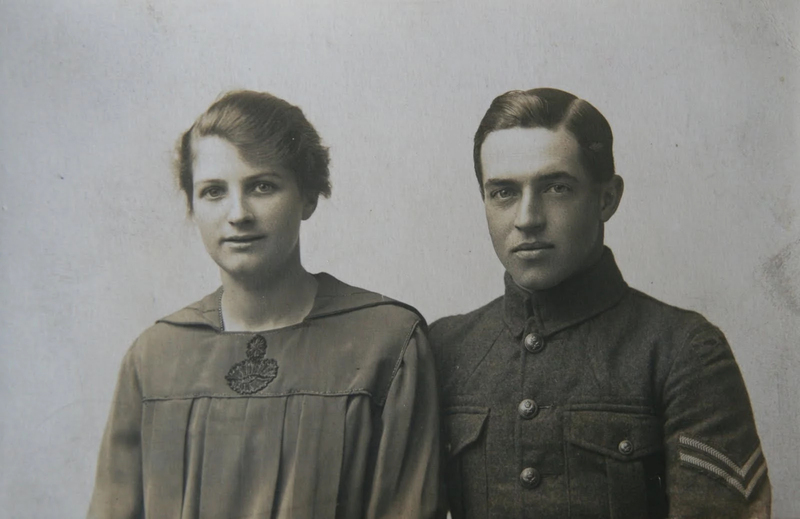 Look out for any old photographs, birth, marriage and death certificates, military records, medals, or if you’re very lucky, letters or diaries that you or relatives might have. Use what you find out to start to build your family tree. Write down everything you know so far about when and where people were born/married/died, and any other key information about them. This will help you work out what else you would like to find out. Wherever your research takes you, make a note of your sources. It will make life much easier if you ever need to double-check something, and helps you keep track of where you have already looked. Search the civil registration indexes – these are indexes of birth, marriage and death certificates which begin in 1837. The indexes are available on various websites – if you visit the ERO or your local Essex library, you can use www.ancestry.co.uk for free. The indexes will give you the basic information of when and where someone was born/married/died. You can find out more by ordering the full certificate, which you can do through the General Register Office, or for Essex certificates from us at ERO. Parish registers are church records which record baptisms, marriages and burials. In some cases these can date back to 1538, and so can be used to go back much further in time than censuses and birth/marriage/death records. 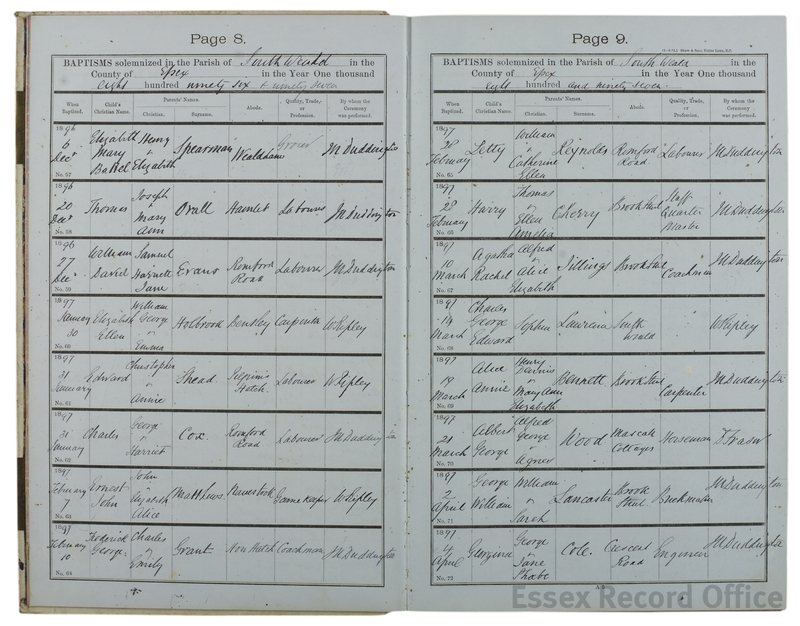 Parish registers for the historic county of Essex (including parts of greater London which used to be in Essex such as West Ham and Stratford) are all kept at the Essex Record Office. We have digitised all of our parish registers and they are all available to view online at www.essexancestors.co.uk (with the exception of marriages after 1957). You can take out a subscription to view the images from home, or use the service for free in the ERO Searchroom. 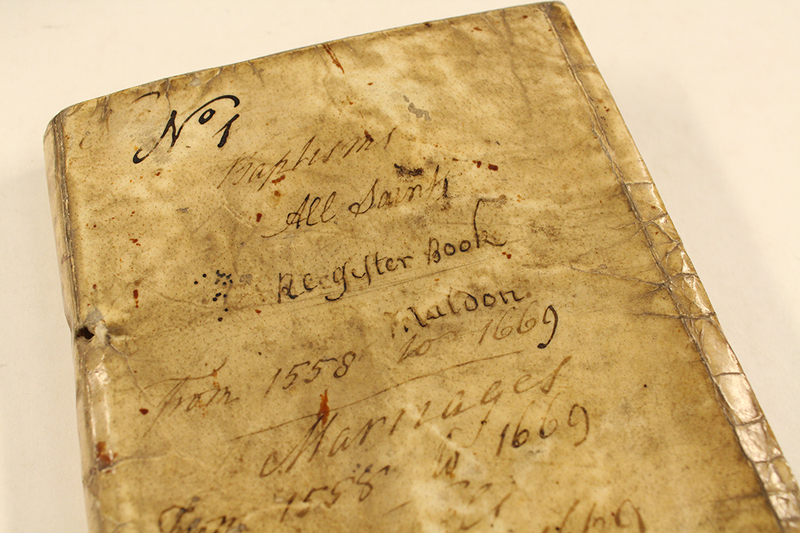 You can also view images of all 70,000 of our original wills, dating from the 1400s-1858. Double-check that the documents you want to view are available before taking out a subscription. If you want further advice or have specific questions about the kinds of records available, talk to our experts either in the Searchroom (find out how to visit us), e-mail us or give us a ring on 033301 32500. As part of our Heritage Lottery Funded project, You Are Hear: sound and a sense of place, we have been installing listening benches across the county. 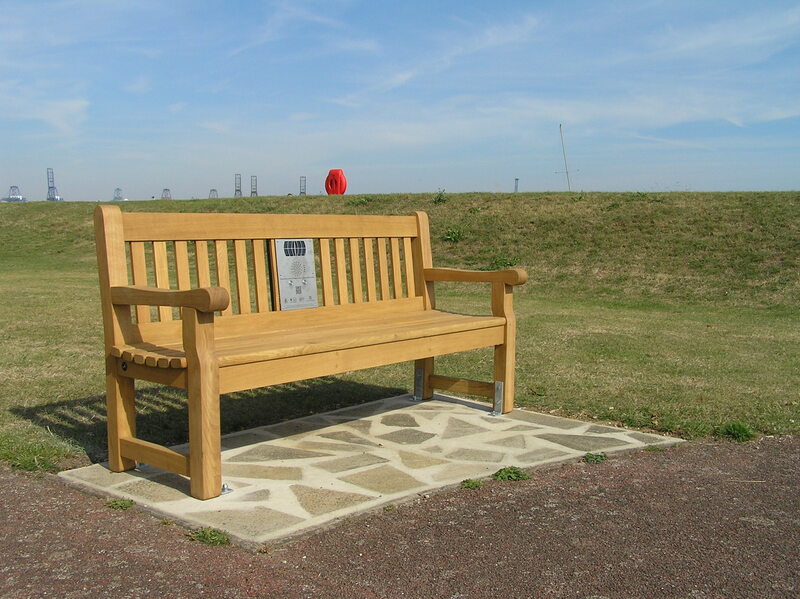 These solar-powered park benches have in-built speakers, so at the touch of a button they play back clips of recordings from the Essex Sound and Video Archive. The clips give an insight into the heritage of the surrounding area, mostly from memories of long-standing residents first recorded as oral history interviews. We have been working with volunteers from each community where we are installing these benches. With training, the volunteers have listened to relevant material from the Archive; chosen interesting snippets; and edited the audio recordings to create a series of short clips for the bench. They have also decided on the location of the bench and arranged for its installation and unveiling. We have both given up our own time to help create the sound bench part of the You Are Hear project, which is now located in old Harwich. The You Are Hear project was very interesting, learning about Harwich history with specific fascinating points like the floods, the building of the promenade and so much more. We spent some time picking out and editing the clips we thought would be good to use for the project and had to create 11 minutes of historic memories of the local area. Creating this project we felt not only inspired but also educated, learning about our town’s history. Once the audio was completed we went to the grand revealing of the bench by the mayor and mayoress. 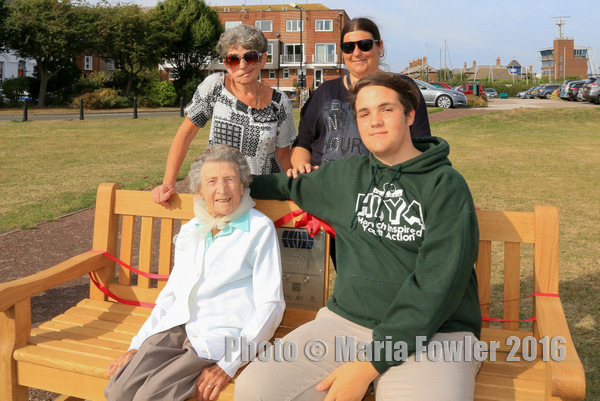 I felt proud to have taken my great-nan, who is 95 years old, to be part of the unveiling of the bench and felt I had shared some of her memories growing up in Harwich. Brandon with his family on the listening bench. Courtesy of Maria Fowler. Although this project took a long time to go through the different clips available, we had the difficult task of choosing the ones that seemed the most informative about Harwich and creating a short 11-minute audio clip with a number of people sharing their memories. I enjoyed meeting the mayor [at the unveiling ceremony], and I feel proud of what we have accomplished. We would hope you all can take the time to go along to sit and listen to the You Are Hear project in Harwich and to feel the same humble connection we did, listening to all the memories people shared over the years about Harwich. Brandon and Stephen at the listening bench launch. Courtesy of Maria Fowler. 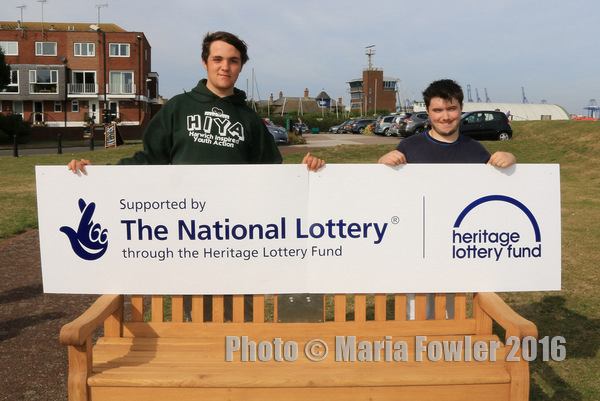 Read more about Harwich’s listening bench on the You Are Hear website. We are grateful to the HIYA teens for working so hard on the project. Do you want to be involved with the next round of listening bench installations? We are looking for volunteers from Burnham-on-Crouch, Chelmsford, Clacton-on-Sea, Clavering, Coggeshall, Epping, Galleywood, Harlow, Southend-on-Sea, and Witham. Please get in touch if you can help. Archives are wonderful places for surprise discoveries. When searching for one thing, you will often come across something completely different that you would never have thought to go looking for. In this sense working in an archive is challenging for the easily distracted, as there is always something intriguing to pursue. Now why my dear Fred don’t you marry? If she says “Oh! Law!” “Mercy”! “How shocking”! If Fred was fortunate enough to find a girl who measured up to these exacting standards one does have to wonder whether he would ever had any fun with her, or indeed a meaningful conversation. Bustles were fashionable from the late 1860s until the early 1890s. This seems most likely to refer to Sir John Herschel (1792-1871), a polymath who published papers and books on a range of scientific subjects between 1821 and 1867. This could refer to a few different publications by Irish scientific writer Dionysius Lardner, who published works about steam engines in 1828, 1832, 1836, 1840, 1844, 1856 and 1857. The polka and galop were lively, energetic dances popular across Europe in the middle of the nineteenth century. 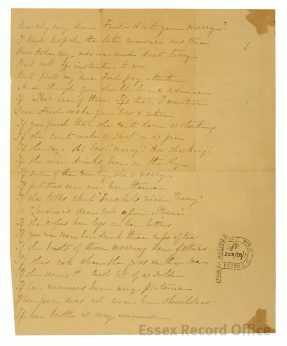 This evidence all points to a date in the 1840s or 1850s, apart from the line about the bustle. If bustles did not come in until the late 1860s, the poem must date from after then. 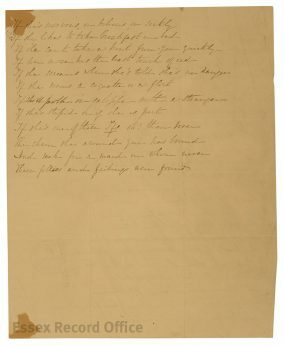 If anyone has any further information or spots any more clues that could tell us more about this poem, do please leave a comment or get in touch with us. 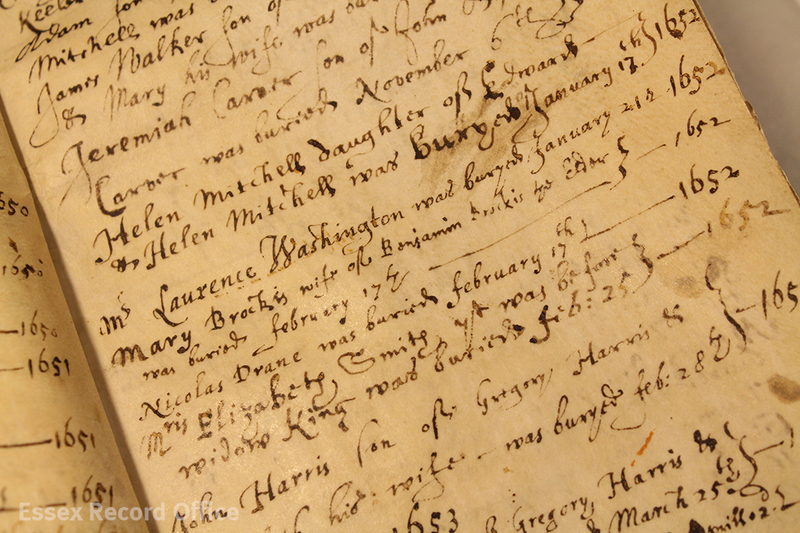 Now that the forty-fifth President of United States of America has been elected, one could perhaps reflect back upon that illustrious line to the first holder of that office, George Washington, one of whose direct ancestors lived in Essex and was buried at All Saint’s Maldon in 1653, as recorded in this burial register. This was George’s great-great-grandfather, Revd. Laurence Washington, who was probably born at Sulgrave Manor in Northamptonshire in 1602, the son of another Laurence Washington. It was Revd. Laurence Washington’s own son John, born at Purleigh c. 1633/4, who emigrated to Virginia in 1653. There he in turn fathered a son also called Laurence Washington who was to be George Washington’s grandfather. Ironically, in view of George’s role in the American War of Independence, Revd. Laurence Washington was a staunch royalist and a protégé of the Archbishop of Canterbury, William Laud. Through Laud’s agency he acquired the wealthy living of Purleigh near Maldon in 1632, and it must have been because of his royalist leanings that Laurence was one of those ministers ejected from their livings during the Civil War in 1643, in this case on a trumped up charge of drunkenness. So, he moved, possibly incognito, to the impoverished parish of Little Braxted. His family did not join him, however, but were sheltered by the family of Sir Edwin Sandys, who helped Laurence’s son John into the tobacco trade thus initiating his connection with Virginia. Sadly, Revd. Laurence died without an estate sufficient to need letters of administration and was buried at Maldon. Incidentally, the burial entry in this register dated 21st January 1652 provides a good example of how one must be mindful of the old style calendar when researching one’s ancestors. Further down the register, one can see that the New Year starts on 25th March, so, the date of burial is actually the 21st January 1653 as reckoned by the modern calendar. The parish register will be on display in the Searchroom throughout December 2016.